Depart for Tarangire National park via Namanga border and Arusha for lunch at app 1300hrs. Arrive for a short late afternoon game drive. The park has an atmosphere of remoteness and has fewer visitors than all the other parks in Tanzania’s entire northern circuit. Blue monkeys, hornbills, pelicans, herons can be seen as well as elephants in large herds, cheetah, jackal, fish eagle, marabou stork and hippos.Lunch at the campsite. Enjoy an afternoon game drive..Dinner and overnight at the campsite. Day is spent in Tarangire with full day game drives. All meals and overnight back at the camp. Leave after a morning breakfast and proceed to Ngorongoro Crater for lunch. Afternoon 1/2 day Crater tour. drive to the Ngorongoro crater and descend down its walls for a full day crater tour with a picnic lunch. It is a thrilling experience to descend down and out of the narrow and steep crater walls of 670 metres depth, which has earned this crater, also the largest in the world the title ‘’the eight wonder in the world’’. Flamingos can be seen seasonally in the Crater Lake, depending on the water level as these birds only breed in shallow water. Many animals, which have made this crater their permanent home, can be seen on the crater floor. Dinner and overnight at the campsite located on the Crater rim. Depart for Serengeti via Olduvai Gorge. Lunch at the campsite in Serengeti. Enjoy a later afternoon/ early evening game drive in Serengeti Park. The term ‘Serengeti’ mean ‘endless plains’ in Masai language. In the central plains there are carnivores like lion, leopard, hyena and cheetah. This park is normally the scene off the annual migration of wildebeest and zebra, which occurs between the Serengeti and Kenya’s Masai Mara. Eagles, flamingo, ducks, geese, egrets, vultures, secretary birds, ibis, stork, heron, kite, pelican, crane and guinea fowl are among the birds that can be seen in the park. Dinner and overnight at the campsite. morning and afternoon game drives in the Serengeti with a lunch and leisure break at the lodge or camp in the mid afternoon. In the late evening, return to the campsite for dinner and overnight. Early morning game drive still in Serengeti. 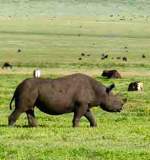 10:00 Drive to the Ngorongoro Highlands. Lunch at Gibbs Farm. Afternoon visit the famous beautiful waterfalls. Arrive for dinner and overnight at the Lake Manyara campsite. After breakfast, have a morning game drive in Manyara Park. The main attractions here are the tree-climbing lions. The park is small in size but the terrain is diverse. The vegetation comprises of groundwater forest, open grassland, swamp and acacia woodland with giant mahogany and fig trees. The park is home to a wide variety of mammals and birds. Lunch in Arusha.